Ah, September. In these waning days of summer, the leaves are crinkling and dropping at an alarming rate, my precious after-work sunlight time is growing shorter, and there’s an undeniable chill in the air. Wait, nope, that’s wrong, and I’m definitely denying it. Ain’t no chill round these parts! Yesterday it reached nearly 90˚F here in Maryland, and the rest of the week promises similar heat. Not that I’m complaining; I will happily take any last drop of summer I can get. But the heat did make the autumnal dinner S and I prepared for his mom last night a little… inappropriate? We had a delicious chili S whipped up, cornbread (from Veganomicon), and baked apples for dessert. Totally fall-like, and totally wrong for the hot weather. No matter, though; it was delicious and eminently healthy. I was especially impressed by the baked apples; I’ve only made them once or twice before, but they’re so easy and so rustically enjoyable! S and I hit up the farmers’ market this weekend, so I used Macintosh apples we picked up there. I simply cored them (anybody have tips for coring apples without a nifty tool? ), stuffed them with brown sugar and spices, and set them in a pan filled with a little water. After 40 minutes in the oven and a bit of Earth Balance on top, they were tender, oozy, and ready for devouring; they actually reminded me of the homemade applesauce my mama used to make every fall. Despite my ringing endorsement of my dessert, it was not particularly photogenic. Plus, we were chatting with S’s mum while eating our apples, and I didn’t want to whip out the camera. So instead of a photo of my baked apples, check out my shopping list from yesterday. It is, unlike the weather, extremely autumnal. Yes, that is an Instagram photo. Yes, my hands are veiny. 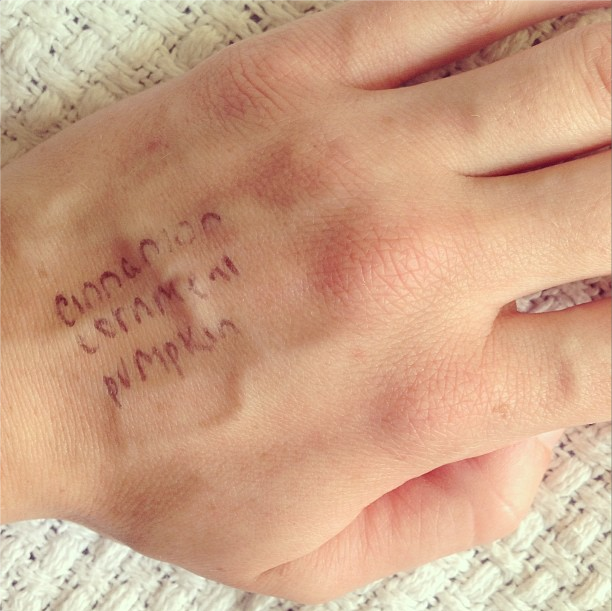 No, I don’t usually write on my hands (maybe like thrice a year, tops). What’s on your seasonal shopping list? How do you like your baked apples? LOVING your blog! 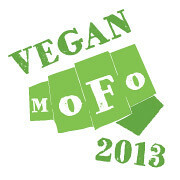 I’m participating in VeganMoFo as well! Swing by when you can. LOVE the usage of “thrice” btw!!!! How very autumnal your shopping list is! We cozied up with Breakfast in Tiffany’s with a fire blazing today!! Crazy! Love baked apples. I like mine with raisins and oats in too.